As the dust settled after what was likely to be the final bout of street politics before a referendum on a proposed new constitution on Friday, pro-reform protest leaders conceded that they will probably have to live with a document they say falls short of their demands. However, they also vowed to maintain pressure for deeper change after Friday’s referendum. Tens of thousands of rival demonstrators faced off in Moroccan cities on Sunday, with one side calling for a boycott of the referendum and the other showing support for the king’s proposed constitutional reforms. The February 20 protest movement says that those reforms are cosmetic and is calling on Moroccans to boycott the referendum. Late on Sunday night as the day’s demonstrations ended, Montasser Drissi, 19, a co-founder of the movement, and other February 20 organisers convened at the offices of Rabat NGO to plan their next steps. King Mohammed VI says that the new constitution strengthens democracy. In recent weeks, royalist demonstrators have increasingly taken to the streets to pre-empt planned marches by February 20, with both sides vying for media attention and patches of pavement. In some instances scuffles have broken out, with royalists reportedly throwing eggs and stones at February 20 activists. Police have alternately tolerated and violently dispersed the movement’s marches. On Sunday evening, scores of royalist demonstrators massed in a square beside Bab al Had, a gate of the old city in Rabat, the capital. “The people want the new constitution,” boomed royalist voices through a set of loudspeakers. 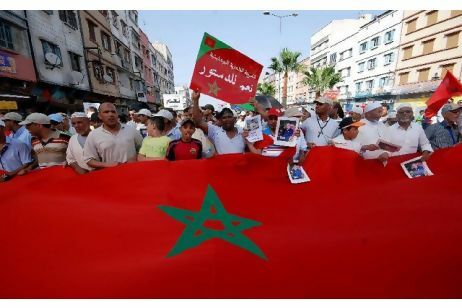 The demonstrators paced, waving the red flag of Morocco and in some cases wearing it as if a cape. Some clutched photos of King Mohammed, and others held up banners denouncing the February 20 movement. A flurry of activity announced February 20’s arrival, as groups of riot police jogged to shunt the movement’s marchers into an adjacent avenue. “The people want the downfall of corruption,” cried the marchers. Some waved placards castigating advisers to King Mohammed whom they say wield influence behind the scenes. Within minutes about 1,000 February 20 marchers were bottled in the avenue, encircled by police who also held back royalist demonstrators. The air rang with competing slogans. “By going to the street, we’re trying to say to supporters of the constitution that they’re not the only voice,” said Ahmed Oujdi, a civil servant from Rabat who has supported February 20 since its birth. Meanwhile, about 5,000 February 20 protesters marched in the working-class neighbourhood of Hay Mohammedi in Casablanca, the Associated Press reported. They were countered by tens of thousands of pro-constitution supporters who marched elsewhere in the city, and attacked by stone-throwing gangs of teenage royalists. The February 20 leaders reject that label, as well as accusations by authorities that the movement is led by leftist and Islamist extremists. Inspired by Tunisia’s January revolution, February 20 materialised via Facebook and has organised a series of protests condemning corruption and demanding limits to King Mohammed’s power. Today February 20 is backed by an unlikely coalition including left-leaning political parties, trade unionists, human-rights groups and a moderate Islamist movement. Under the proposed new constitution, the prime minister must come from the winning party in elections and has broadened powers to form a cabinet. However, King Mohammed keeps control of military, security and religious affairs, and heads the Supreme Council of Justice. With relative peace returned to the streets, Mr Drissi said he hoped people would pause and consider the effect Friday’s vote would have. 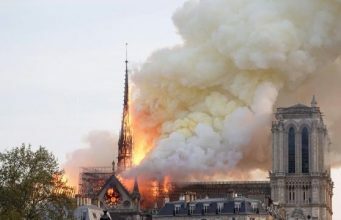 “We can use this moment to push people to reflect,” he said. As for his own plans on Friday as Moroccans go to the polls, “most likely, I’ll go to the beach”, he said.